What is it? A wizard to enable you to create and embed a timeline of curated content. How is it of use to journalists? News sites often use a timeline for digital storytelling. This is a tool just released to enable you to do just that. There are several examples, such as a Timeline of the Republican run-up. Mashable compares Timeline to Storify, a tool that enables you to curate web content by dragging and dropping tweets and other media to create a story. Timeline does not offer the simplicity of Storify and although aimed at non-techies, it will require you to add some code to the head of your site and will take a quite a bit longer to create than a Storify. One way you can create the timeline is by using a Google Doc. 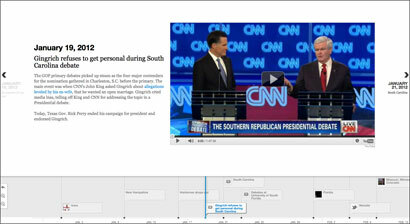 Timeline provides a template and you can simply add your links to the media. 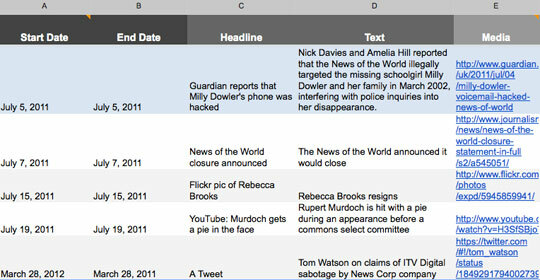 For example, the below screenshot shows how we used the Google Doc template to create a timeline of some of the key phone-hacking moments, adding a Flickr photo, tweets and YouTube footage. This entry was posted in Tool of the Week and tagged journalism tool, mashable, timeline builder, timelines on March 29, 2012 by Sarah Marshall.